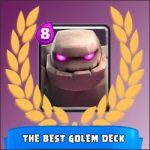 Golem and Graveyard: deck+tactic tips | Clash Royale fan-site! 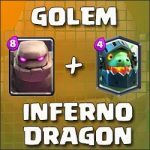 Home » BLOG » Golem and Graveyard – an incredible attacking power! Golem and Graveyard are the epic and legendary cards in Clash Royale the total cost of which is 12 drops of elixir. Despite the huge cost, these two cards suit each other perfect and create a very powerful attacking combination in the Game. 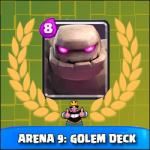 Moreover, if to support Golem in the attack with Witch or Night Witch – the result will WOW you! Golem – tank card! Powerful stone giant that fully ignores all enemies around him and attacks only buildings! Distinctive feature of this character is his huge hitpoints (on the fourth level – 5 984 including the health of two Golemities). Due to this, Golem can withstand against mass of enemy troops relatively for a long time. 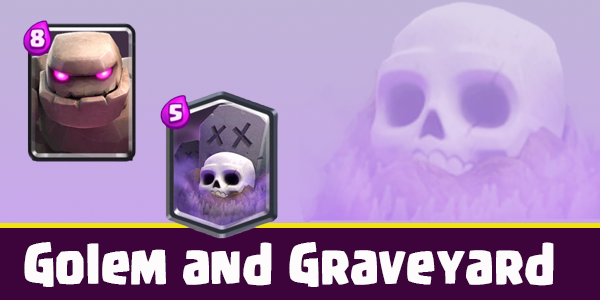 Graveyard is a legendary card in Clash Royale, which is not effective if to use it alone without appropriate support! However, with the good-chosen pair this card turns into a very powerful means of attack. To my mind, Golem is a very good pair for Graveyard. While all opponent’s troops pay their attention to Golem and try to eliminate it – skeletons quickly attack a defenseless tower. With the help of this deck, I successfully compete on the Arena 10 and gradually increase my trophies number. Witch, Log and Poison. Three cards for supporting golem during his movement to the Tower. If you have Night Witch – I recommend you to replace poison with it. Electro-Wizard. Very good troop that can easy cop with Inferno Tower and Inferno Dragon. Archers and Tesla. These two cards are for the defense mostly. Archers can be replaced with Goblin Gang or Skeleton Army. A few words about Tesla. 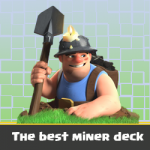 I recommend to include at least one defensive building-type card in the battle deck. I prefer Tesla due to its ability to hide into the ground that makes difficult for enemy to destroy it with any spell type card. The most important thing in attack is the right sequence of cards deploying. I always try to start attack from deploying Golem at the lowest part of my side of Arena. Note:don’t deploy Golem until your stock of elixir is full. In other case, you can miss fast enemy attack. After Golem I try do deploy Witch or Poison. Any of these cards can relatively easy deal with mass of opponent’s troops with the low hitpoints level. Graveyard is the third card in the sequence. 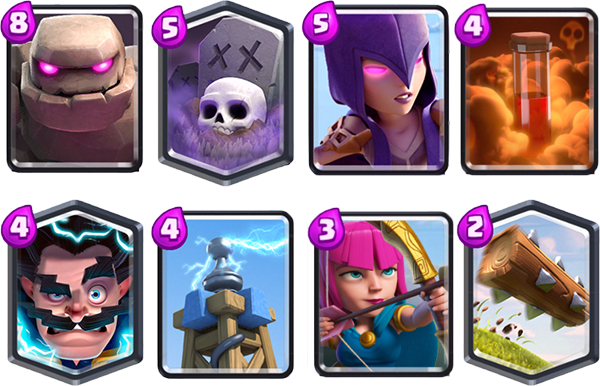 Note: don’t deploy Graveyard until enemy troops and Princess on the Tower start attack Golem. It’s important. Tagged Arena 10, Golem, Graveyard.